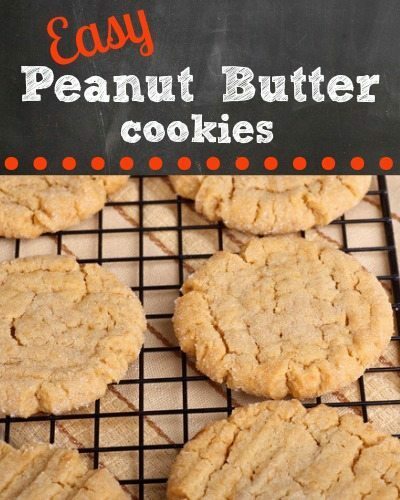 This is a novel recipe for easy Peanut Butter Cookies. Speaking of cookies, I wish I had a dollar for every cookie I’ve baked over the last 30 years. I know you’re supposed to be efficient and bake cookies in bulk, but we usually make a half-batch at a time and eat them fresh and warm from the oven. Sometimes we find that we’re out of an ingredient like butter or chocolate chips for our favorite Oatmeal Chocolate Chip Cookies. With only THREE common ingredients, these cookies are a nice substitute for variety. Beat egg whites until stiff and fluffy. Add sugar and mix well. Add peanut butter. Roll into small balls and press with fork. Bake at 350 degrees for 10-12 minutes. Unwrap some chocolate kisses and pop one on top of each cookie to make them fancier–or just to add chocolate, which makes almost everything better. We’ll have to try it with vanilla, Mae–my husband brought back big bottles of vanilla from his trip to Mexico! It hadn’t occurred to me that they are gluten free–thanks for the tip! They’ve come out of the oven and they taste great! Kids will be pleased when they get home from school. Will try them with the vanilla next time. Love that they are dairy and flour free!